The story of Dr. Abner Mality, head scientist at Wormwood Laboratories, is shrouded in mystery and clouded by darkness. The facts that are known are these: he was born in the American Midwest in 1963, the son of parents who had no idea what terrors their child would unleash. They would not be to blame for Dr. Mality's twisted deeds. They have suffered enough and do not need to be named. Young Abner's fascination with dark science erupted at an early age, when he was caught sewing a kitten and a rattlesnake together. Also, he used the school laboratory to concoct hallucinogenic brews intended to make his classmates bow to his will. Finally, he was kicked out of North Boone HIgh School and later Rockford College. He tried to convince society at large he was a "normal" person and used the name Mike Korn, the alter ego by which he was known by many. And indeed, for several years, he did live peacefully. But the old feelings rose to the surface and Dr. Abner Mality once again returned. 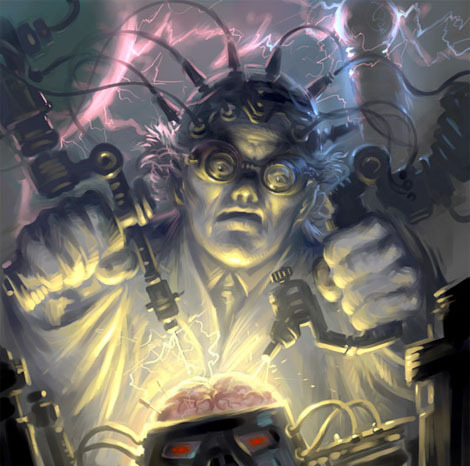 Instead of transplants and drug experiments, he decided to give birth to an unholy fanzine, a compendium of all that was noxious in his troubled mind. This zine was known as the Wormwood Chronicles. He found a group of degenerate followers, possessed of great talent but no morals, and started his crusade, which began slowly. But the Wormwood Chronicles soon gathered force and power, becoming a disruptive force in the lives of millions. Now, in Dr. Mality's final attempt to seize power, it has spread its malignancy to the internet, where it threatens the entire world. Tremble, humanoids, and pray that his schemes do not succeed!